We’re confident that we can offer you something different - better futures aren't down to chance. If you're at school, university or looking for a career change, we have programmes that could be of interest to you; work experience, internships, insight days, industrial placements and graduate opportunities. We're independent and that means we encourage all our consultants to be individuals, to think freely, challenge the way things are done, and offer up the best possible solutions for our clients and the firm. Take a look at our employee's first impressions of Hymans Robertson. We welcome applications from both current students and career changers if you meet the minimum entry criteria for our programmes. As either a new Trainee Consultant, Summer or Industrial Placement student, it won't be long before you get first-hand experience of our values that underpin everything we do: being friendly, partnering, confident and straightforward. We provide you with the training, development and support to become successful in your role. You'll work alongside some of the sharpest minds and potentially work with clients from an early stage. Best of all, you'll be in control of how your career develops.. We encourage individuality; we won’t pigeonhole you; we want you to make the most of who you are. For school students, our work experience programme will give you a flavour of all of this! Graduated or in your final year? Then start your consultancy career with us in either our Actuarial & Benefits or Investment Practice Areas or our Life and Financial Services team which sits within our Insights and Analytics Practice. Our consultancy roles require a strong blend of technical and people skills and a passion for what we do. You’ll study to qualify as an actuary through the Institute and Faculty of Actuaries, with the option to study for the Chartered Financial Analyst exams if you join the Investment team. Full study support and guidance is provided by us. From the start you’ll get hands-on training and you'll be able to apply your mathematical and analytical skills to provide brilliant tailored solutions to ease our clients' problems. You’ll be analysing complex data and presenting the results of calculations and sophisticated modelling in an engaging and compelling way to help our clients make the best possible decisions. You'll be allocated a People Manager and a Buddy who will work with you to ensure you're making the most of your potential and progressing your career at a pace that suits you. You will also be able to take advantage of our exciting new outcome driven Consulting Roots Programme, an objective driven framework that will help you achieve early on in your career; client interaction, building your professional network, gaining commercial awareness and being part of our business development and growth. In this short video Sam, Andrew and Ben talk about their roles as Trainee consultants in our different practice areas. Thank you for the applications we have received to date. We will be assessing and processing applications as they have been received. Anna, Chevonne and Crawford talk about 'consulting roots'. Ben and Kirsty talk about Life as an investment graduate at Hymans Robertson. 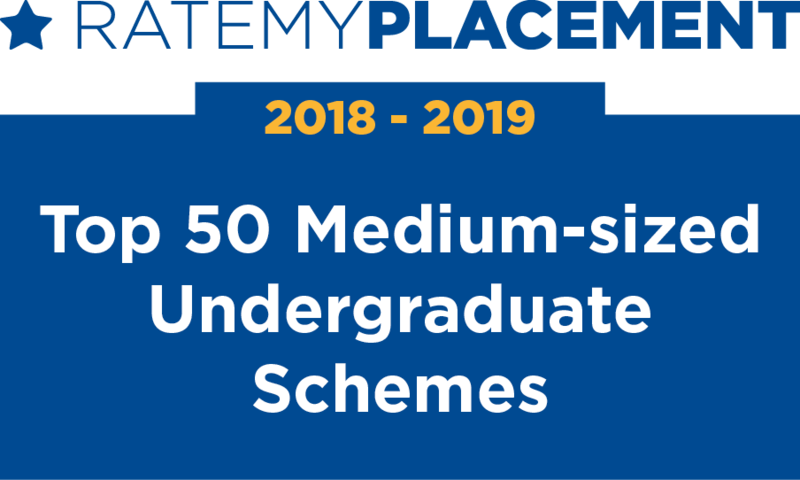 We're delighted to have been placed in the Top 50 Medium-sized Schemes with Rate My Placement for 2018-2019. Our 8 week summer programme, from the first week of July, is for penultimate year university students and will give you a real feel for what a consulting career is like with us. Internships are available throughout the firm in either Actuarial and Benefits, Investment or our Life and Financial Services team. You’ll be involved in a wide variety of stimulating and challenging work and learn from our exceptional consultants. You’ll also work on and present an individual research project that's of real value to our business. If your internship is successful we may offer you a conditional place on our Trainee Consultant programme after you've graduated. We will be assessing and processing applications as we receive them. Our popular Insights Day runs for 3 hours and aims to give you a feel for what we do, what it’s like to work here and what kind of career opportunities are available to you. It’s a chance to meet with some of our employees, hear about what they're working on, ask them questions and experience our working environment first hand. Our February and March days are now complete. New dates will be published here in due course. Please register your interest below. stating your choice of office. A 9-month programme which starts late June in our Actuarial and Benefits Practice in Glasgow. This gives you a real chance to become part of the firm, get involved in challenging work and learn from those around you. The work you do will be similar to that of our new Trainee Consultants and will be of real value to both you and us. If your placement is successful we may offer you a conditional place on our Trainee Consultant programme after you've graduated. You will either be in your penultimate year of your undergraduate degree, in the final year of your degree and planning a Masters or Post Graduate qualification, or already graduated and planning a final year of university study in 2020, following this programme. The programme is designed to give you an insight into what we do at Hymans and how we do it. Real work experience is also a feature of this programme, in an extremely supportive environment. We're friendly, helpful and love to be asked questions! You will also get the chance to participate in a fun group exercise to practice and improve your team working skills and we will provide you with hints and tips on how to participate successfully in a selection process. Diversity is key at Hymans as we work to combine different perspectives, styles and experiences. This we believe is the recipe for our future success. We welcome applications from school students of all backgrounds, as we believe in giving everyone an equal chance to participate in this programme. If our core values of friendly, partnering, straightforward and confident in your intellect resonate with you, then we’d love to hear from you. You will need to have achieved or be working towards a GCSE, National 5 or equivalent in Maths and English. Our next work experience programme will run week commencing 24 June (Glasgow and London) and 1st July 2019 (Birmingham and Edinburgh). Reasonable travel expenses will be reimbursed and agreed subject to discussion prior to attendance. Pure actuarial work typically involves predicting future financial events, especially when the amount of a future payment, or its timing, is uncertain. It's often really challenging, with a wide range of issues to be considered, including business operational factors, potential changes to legislation, and long-term demographic trends. Actuaries therefore have to be highly technical and able to perform complicated mathematics. Our consultants have to be highly technical and able to perform complicated mathematics and analysis. In addition to the technical work, our consultants are also innovative thinkers, creative solution-finders and really effective communicators. This blend of skills allows our consultants to work in partnership with a diverse range of clients, providing tailored advice and solving real financial and business problems. Making financial futures more certain. With a wide range of business areas, clients and an outstanding reputation, there are many stimulating opportunities for career development within our firm. Our independence allows you to have the opportunity to pursue the areas that are of most interest to you, in a truly friendly and supportive environment. Have a look around our website to find out more! In addition to a highly competitive salary, we offer an award winning flexible benefits and family friendly package, which you can tailor to suit your lifestyle. Enhanced maternity and paternity policies. We offer extensive opportunities for career development. You will be assigned a People Manager and a Buddy who will support and guide you through your career. Your role is not ‘boxed in’, yes you need to get to know the basics but right from the start we can offer you a role where you feel truly valued as part of a firm who cares about peoples’ financial futures. In return we naturally expect you to work hard to achieve your potential but in an environment where we have a strong focus on wellbeing. Our firm wide Wellbeing Group work hard to help you support both your mental and physical health. Minimum GCSE English Language Grade B, Scottish Higher Grade C, or equivalent. You must meet or exceed the minimum entry criteria. If you have an equivalent qualification to A-Level, GCSE or Scottish Higher, please provide evidence with your application that this meets the minimum entry criteria. Do you have an Industrial Placement or Summer Internship programme? We offer award an winning Summer Internship programme for penultimate year university students in either Actuarial & Benefits, Investment or Life and Financial Services. The internship lasts for 8 weeks from the beginning of July. You'll have the opportunity to work alongside some of the most talented consultants in the industry and get some fantastic, hands-on experience and insight into an actuarial consulting career. In addition you will work on an individual project throughout your internship. Our Industrial Placement programme is also for penultimate year university students and runs from July to March in our Glasgow Actuarial and Benefits practice area. All of our trainees are given one study leave day per week en route to qualification. You'll be expected to do more study in your own time. In total you should be studying for a minimum of 20 hours a week to give yourself the best chance of passing the exams. Your people manager and study mentor will be there to support you through this. Please research our firm, the role and the career path before you apply, we need to be right for you and you for us. Our Trainee Consultant Programme is now open with our Summer Internship and Industrial Placement programmes open later in August. What is the selection and assessment process? Minimum entry criteria check: We will ask you to complete a short application focusing on what you know about us and the role. This is your chance to evidence the research you have done. Take your time to review our website, come and meet us on campus, at one of our open evenings or give us a call! Laura is available on to chat about our Intern programme on 0141 566 7543 or you can call Heather about our Trainee roles on 0141 566 7651. At this stage of the selection process we will do a minimum entry criteria check and assess your full application later in the process. Online Situational Judgement Test (SJT): If you pass the numerical test, we will send you a link to complete our bespoke situational judgement test. You’ll receive full instructions on how to complete the test together with the time scales to do this. This will give you an insight into the role and the types of situations you may find yourself in, if you are successful in securing a role. SJTs assess your ability to make a judgement about a real life situation and by doing so indicates your potential in the role you are applying for. The test presents you with situations that you could face in the role you are applying for. Often these situations are challenging and not something you would face every day but they do reflect the business environment and aspects of the role. The test then asks you what you would do in each situation giving you a choice of four options. In this case we are looking specifically at whether you are likely to behave in the way that we prefer people to behave in the firm. We have built the SJT to align with our core competencies and it tells us, no matter who you are and your background, if you will be naturally drawn to the best approach for our clients in a challenging situation. We are asking you what you would do first in a situation as we appreciate that in a complex environment, such as ours, there are many things you would do, not just one. However, we are most interested, for the purposes of this test, in what you would do first. These types of tests are a good way for us to be able to process your application quicker as it is automated and objective in its scoring, so we can make a quicker decision about whether you may be a good fit and move you to the next stage of the recruitment process, rather than you waiting for a longer time for us to manually process everything. The SJT also helps us tell you more about the job in a very easy way through the use of stories, which bring to life the type of company we are and what the job could entail. It could therefore help you to make a decision about whether the role is right for you. There is no time limit to completing our SJT, but you will need to do it in one sitting. Full application form review: here we will review your knowledge of our firm, what we do and the role you are applying for. Please make sure you have done your research! Telephone interview: If you are successful at application form stage, you will be invited to participate in a short telephone interview with a member of our friendly HR team. The interview will ask you in the main to elaborate on what you have detailed in your application form so that you can demonstrate your full understanding of the role, our firm and your chosen career. Final interview, analytical and written tests: Successful candidates at telephone interview will be invited to attend a final interview at your preferred office. The practice area you applied for will deliver the interview which will be strengths based for approximately 45 minutes. You will then be asked to complete an analytical test and written test. Finally, you will meet one of our most recent Trainees so you can find out more about life at Hymans and also see the office. This meeting is not assessed. What is a strengths- based interview? A strengths-based interview is different from a competency based interview. Strengths-based interviews are a fairly new approach that some recruiters are moving towards as a way of finding out what candidates enjoy. While competency based interviews focus on what you can do, strengths-based interviews focus on what you like doing and are more positively worded. Perhaps nothing is more revealing about who you are than what you enjoy doing and this can tell interviewers a lot about your potential in the role you’re applying for. Interviewers in a strengths-based interview will be trying to find out what kinds of activities engage and energise you. This is because when you are using your strengths, you will often perform to the best of your ability and quickly learn new things. The questions in a strengths-based interview will be designed to identify whether you have strengths in areas which are important in the role you’re applying for. Interviewers may also ask questions relatively quickly in order to get a genuine and spontaneous response from you. Consider also the academic achievements and extracurricular activities you included in your application form. Think about what you most enjoyed, and why. When were you most engaged? What did you take most pride in? Assessing what you most enjoy will help you to clarify what you want out of your career, as well as preparing you for contact with an interviewer who takes a strengths-based approach. Think about your body language as well. How do you come across when you talk about something you enjoy compared to when you enjoy something less? What do you notice about the tone of your voice and other visible signs that you give off? Interviewers will notice these things. Last but not least is the fact that we want you to enjoy the interview experience and that’s most likely to happen when you’re being you! Resilience, self-improvement and job motivation. Every application for all our programmes will receive a response. Due to the very high number of applications we receive and telephone interviews we conduct, we are unfortunately not able to provide individual feedback to candidates at these stages. Are there any other graduate programmes? We currently offer our graduate Trainee Consultant programme, however, if you are interested in joining us for any other role, you can make a speculative application through the 'Apply Now' tab. Can I meet people from Hymans Robertson to find out more? Women In Investment - Tuesday 2nd April 11.30am - 1pm at our London office. Do you run any employabilty skills sessions? Yes, we do. We're going to run a few webinar skills sessions on popular and current topics like effective application forms and an introduction to Situational Judgement Tests. Details of future sessions will be available here in due course. We also have a variety of experienced hire vacancies.